Once the phage library has been generated, the panning process begins by incubating the phage population with an immobilized antigen. Such "phage panning" or "bio-panning" is similar to a solid-phase immunoassay. In this process, the antigen of interest is immobilized on microplate wells or magnetic beads, or is biotinylated and later captured in the process. Also, selection on cells, on membrane fractions or on tissue sections has been shown. After extensive washing to remove all unbound phage, the bound phage are eluted and amplified by replication in new host cells. The selection procedure is repeated typically one to three times, resulting in a population that consists mostly of phage that display the desired antibodies, i.e., antibodies with affinity to the used antigen. After these selection steps, the antibody genes are isolated and inserted into an expression vector. 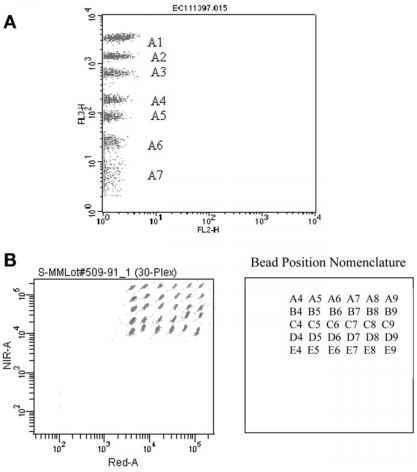 Schematic expression cassettes (7,8) for single-chain antibodies and for Fab fragments (see Below), which are based on the lac-promoter, are shown in Fig. 1. The Fab expression cassette is mostly arranged as a bicistronic unit, whereby the antibody light chain gene is located upstream. This arrangement ensures that there is more light chain present than heavy chain because heavy chains are prone to aggregation without a light chain partner, whereas light chains are soluble. To produce soluble antibody fragments after selection, the antibody genes cloned into the phagemid are then expressed without the phage coat protein, which is usually achieved by either removing the DNA encoding the phage coat gene III protein from the vector or by subcloning the whole pool of enriched antibody genes into an expression vector. At this step, the transformed cells are isolated as single colonies, each producing a defined and therefore monoclonal antibody. A number of colonies are separately picked, grown in microtiter plates, and antibody expression is induced. Because antibodies contain disulfide bonds that are necessary for maintaining their overall structure and binding activity, the folding of the molecule has to take place under oxidizing conditions. Gram-negative E. coli provides an oxidizing compartment between the cytoplasmic and outer membrane, the so-called periplasmic space. Hence, the attachment of bacterial leader sequences to the N-terminus of an antibody fragment directs the translated antibody chain(s) into the periplasmic space by the bacterial transport apparatus, where folding can take place under oxidizing conditions. Fig. 1. Design of HuCAL® Fab antibody expression unit (see ref. 2). The bicistronic operon is under control of the lac promoter/operator, so expression can be induced with Isopropyl P-D-1-thiogalactopyranoside. Both L and H gene segments are preceded by signal sequences (derived from the Escherichia coli ompA and the phoA genes) that ensure transport to the periplasmic space. The elements that are located downstream of the heavy chain gene segment between the EcoRI and HindIII restriction sites determine what valency the final product will have and what tags or fusion partners will be attached to the Fab molecule. Note the modularity of the gene segments resulting from the location of unique restriction sites, whereby each segment can be easily exchanged by compatible modules. sequenced to determine the number of unique antibodies from a selection. The process previously described can be automated to a large extent using standard pipetting robots, thereby enabling massive increase in throughput, one of the advantages over animal-based methodologies. Target molecules presenting therapeutic interests can be receptors expressed on the surface of a particular eukaryotic cell line. Screening of recombinant antibody fragments on whole cells has been successfully applied, for example, to isolate binders targeting the fibroblast growth factor receptor 3, which belongs to a family of cell surface receptor tyrosine kinases, or the intercellular adhesion molecule 1 (7,8). Specific antibody fragments binding to a receptor molecule in ELISA can be further tested for their binding capacity on the surface of the eukaryotic cells. Cells expressing the endogenous molecule or cells transiently transfected with an eukaryotic vector expressing the target molecule can be used. In both cases, incubation steps of bacterial extract containing antibody fragments and cells are carried out at 4°C. At this step, the panning method has typically resulted in the isolation of a number of different antigen-specific MAb fragments starting from the original large library of antibody genes. The procedure overall takes about 4-6 wk, albeit massive reduction in timelines have also been reported. Now the antibodies can be individually expressed and purified in larger scale. Soluble antibody fragments produced by bacterial colonies isolated as previously explained are typically purified by one-step affinity chromatography using peptide tags that have been fused to the C-terminus of the antibody fragment. After purification, the material is mostly aliquoted and stored frozen, similar to traditional MAbs.